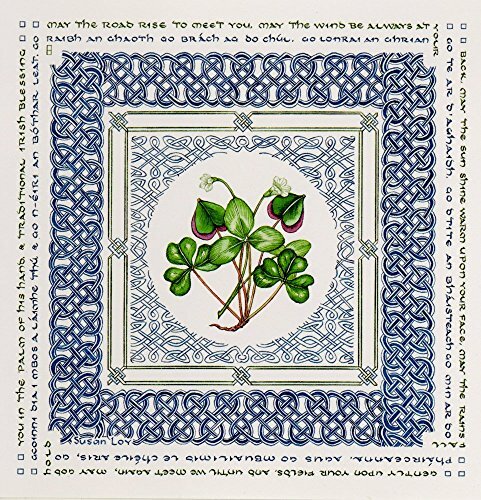 "May the road rise to meet you" is perhaps the most famous traditional Irish blessing: The often cited source of this blessing is Romans 15: 13, which begins, "Now the God of hope fill you with all joy and peace..." Susan hand lettered the texts in English and Gaelic. Borders of interlacing Celtic knots surround the shamrocks. The shamrock is the national flower of Ireland, and Irish legend associates the shamrock with St. Patrick. The word shamrock is anglicized from Seamrog, which means trefoil, or three-leaved. Botanists are equally divided as to which plant is the true shamrock, agreeing that it is either the white clover, Trifolium repens, or the wood sorrel,Oxalis acetosella. Susan painted both species of shamrock with their bright green trefoil leaves. May the road rise to meet you. May the wind be always at your back. May the sun shine warm upon your face. May the rains fall gently upon your fields. And until we meet again, may God hold you in the palm of his hand. In Gaelic Go n-éiri an bóther leat. Go raibh an ghaoth go brách ag do chúl. Go lonrai an ghrian go te ar d'aghaidh. Go dtite an bhtháisteach go min ar do phtháirceanna. Agus go mbuailimid le chthéile aris, go gcoinni Dia i mbos A ltháimhe thú. Inside card is blank. Each clear vinyl sleeve contains 12 cards (5' x 5') and 12 envelopes. If you have any questions about this product by Literary Calligraphy, contact us by completing and submitting the form below. If you are looking for a specif part number, please include it with your message.